PENN YAN—The Penn Yan village board covered an extensive list of issues during a three and one half hour meeting, Dec. 16. After discussion Keith Woodard, Jr. was appointed to a position on the police department. Trustee Robert Hoban asked the board, "Do not fill this position. Put the Investigator back in uniform." Trustee Bob Church said the proposed resolution would let Woodard be sent to law enforcement school. He said the position is being filled to take the place of a retiring officer. Woodard's father Keith has informed the village he intends to retire early in 2009. Mayor Douglas Marchionda, Jr. added, "We have to have this person in school so he can work in midsummer. This has nothing to do with the Investigator position." When the vote was taken, Hoban voted no and trustee Nancy Taylor abstained. • Hoban reported the school district, county and village are exploring a shared services project that could result in a fueling/mechanic station for all three. He said there has been no meeting recently about the possibility of shifting the village court to the Yates County courthouse. He has spoken to an ombudsman who will attend the next meeting to provide assistance. • First assistant fire chief Rick Retorick spoke to the board about a letter the fire department sent to the village in October requesting a pickup truck for the department to use for hauling equipment and brush fires. He said, "This is the only entity where volunteers are hauling village equipment in their own vehicles." He said a pickup truck would also be more economical that taking a $500,000 fire truck to a pump detail. Marchionda said there are some issues including the fact that the truck belongs to the Municipal Utility Board (MUB). He said, "Revenue must be addressed. To give it to the fire department is not that simple. You are asking to add a vehicle to the fleet." Marchionda said he didn't disagree with using village trucks, adding, "I don't see any reason we can't give you access to village pickups immediately." Assistant director of public works Richard Osgood said, "I understand the need for it and support it. Is it possible for MUB to enter into a contract to lease a truck to the fire department on an as needed basis?" Osgood also said the pickup truck assigned to him could also be used. • Public works committee chairman Willie Allison announced the signs for truck traffic have been installed. 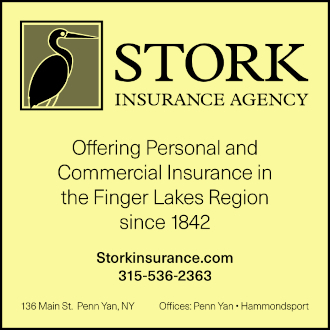 Allison said he has been contacted by Finger Lakes Economic Development Center director Steve Griffin regarding the stimulus program proposed by President-elect Barack Obama. Projects must be ready to go in 60 days. allison said the village has a number of projects ready to go. One of the largest is work on the village sewer system. The Clinton Street arch, a project estimated to cost $1 million, is also a concern. • The board discussed the need for a new Programable Logic Controller for the water plant. Osgood said, "I'm frustrated. This piece of equipment has been spelled out several times. If we don't do it now we'll roll the dice and wait till fall and it fails there will be eight or nine people working seven days a week pumping water till it is replaced. This equipment runs the plant. We would have overtime seven days a week without it." Valves would have to be operated manually in the event of failure. A motion referred to the village board from MUB asked authorization of spending up to $225,000 for the PLC system upgrade providing the money is available in the capital improvement fund. During discussion that followed, it was determined that there is $48,000 in the fund currently with an additional $12,000 due when the next bill goes out. Marchionda said he was uncomfortable making a decision during the meeting because no members of MUB were in attendance. He said, "We would be making a decision in a vacuum." Church suggested a meeting be set up with MUB chairman Rom French to gain further information on funding. • Sandra King gave the board information about services her company could provide to the village to keep than in compliance without he New York State Workplace Violence law. She is a partner in Practical Consultants LLC. King, a retired New York State trooper, said, "Behaviors have changed so much over the years. The unthinkable has become thinkable, then doable." She outlined services available through her organization. Village attorney Ed Brockman suggested the information be sent to the village personnel committee. The New York State Workplace Violence Law has been in force since March 2007. • Trustee Bob Church thanked Scott McCredy for allowing fire trucks to park inside his business while a problem with the overhead door at the firehouse was resolved. • Heard from representatives from Reality Check who asked the board to pass a resolution supporting their cause of opposing youth smoking. The group works with youth ages 12 to 18. The next meeting of the village board will be Jan. 20, 2009 at 7 p.m.